The Fruit Farm Slot by Novomatic is a five reels slot with three rows and 10 paylines. The Slot has a farm theme and on your reels land many animals and fruits. The reels are surrounded by a wooden frame and in the background you can see a farm. The Fruit Farm Slot comes from the famous Novoline series which also includes top games like Dolphins Pearl or Book of Ra. Your goal is free spins, because here all your winnings are paid with a 3x multiplier. 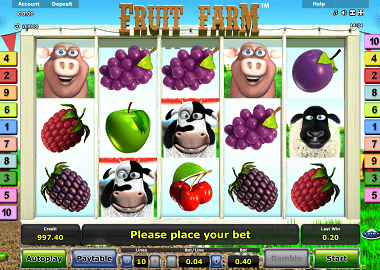 Fruit Farm is an older game and therefore only available in a few online casinos. Symbols and payouts: The symbols of the Fruit Farm Slot are in cartoon style and are only themed symbols. The low-paying symbols are all fruits such as berries, cherries or even apples. With these symbols you can win up to 400x your line bet. The animals on your farm pay even better. Here you win with 5 identical symbols up to 750x your line bet. That includes sheep, cows, pigs and geese symbols. Wild and Scatter symbols: The Wild and Scatter symbols are the most valuable symbols that land on your reels. The Wild Symbol is the farmer’s boy. It replaces all symbols as wild symbols on your reels except for the scatter symbol. With 5 symbols you win 9000x your line bet. In addition, your profits when substituting will be doubled. The scatter symbol is the tractor. This symbol also triggers instant winnings if you only get 2 symbols on your reels. Then you win 20x your line bet. Free Spins feature: The Free Spins feature is the only bonus feature on Fruit Farm Slot. You trigger the free spins with at least 3 tractor symbols. Then you get an instant win of 50x your line bet and 15 free spins. If you get 4 Red tractor symbols, you will bet 200x your line and 5000 symbols with 5000 symbols. The biggest benefit during free spins is the 3x multiplier on your winnings. You can also extend the bonus feature with 3 new scatter symbols at any time. The Fruit Farm Slot and other Novomatic Slots you can also play for free. Click on the Fruit Farm Banner and the game will open in a new window. Other Novomatic slots can also be found on our Novomatic review page. Below are some very good Novomatic casinos for UK players. For the LVbet Casino we offer a special bonus. There you can play 30 LV spins for free on the netent slot Aloha! Other top UK casinos are the Guts Casino and the Rizk Casino. Payouts last only a few hours!